The cute pot-bellied Lord Ganesha is the cynosure of the eyes of every Hindu and Ganesh Chaturthi is supposed to be the birthday of this lovable god. Fill your Ganesh Chaturthi festivities with much merriment as possible with this fantabulous Crossword Puzzle themed to Ganesh Chaturthi. If you like solving it, click here to pass it on to your friends. Say "Ganpati Bappa Morya" and get going! Your festivities are sure to skyrocket with this fantastic crossword puzzle based on Ganesh Chaturthi. Just take out a print of the puzzle template and solve the verbal clues to determine the words that are likely to go into the corresponding blank boxes of the puzzle. Enjoy cracking the puzzle! 6) Grab the printout of your crossword template, solve the clues to fill in the boxes and puzzle! 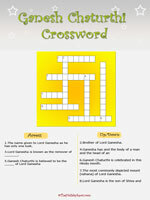 Step up your festive fun with this awesome Ganesh Chaturthi crossword.